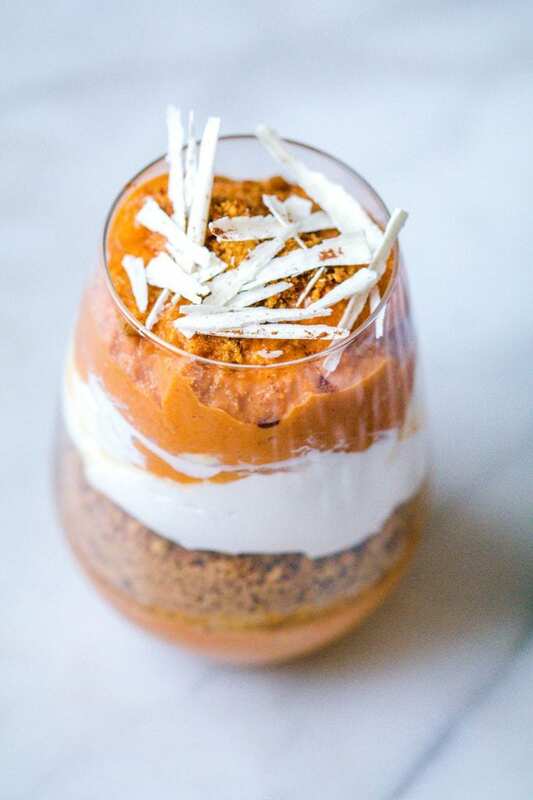 If you don’t want to fuss with pumpkin pie in the kitchen this year, you’ll be obsessed with this easy Pumpkin Pie Parfait! Today, I bought all the ingredients to make a Pumpkin Pie and an Apple Pie. The afternoon snuck away from me and I only got to making the Apple Pie. I absolutely adore making pies from scratch. There is something so relaxing and rewarding about baking a homemade pie, especially during the holiday season! Sometimes, you don’t have all afternoon to make a homemade pie. This is where these Pumpkin Pie Parfaits come in to play! And at the end of the day, we’re not always in the baking mood! This recipe is a homemade, delicious dessert that seems fancy enough to your guests and it’s only 5 ingredients! It’s essentially pumpkin pie in a cup. No no…Pumpkin Pie in a wine class. Or…Pumpkin pie in a mason jar – whatever you want to serve it in – it tastes just like a good homemade pumpkin pie! 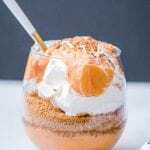 I love making these parfaits for any Fall or Winter occasion – whether it be for Halloween, Friendsgiving, Thanksgiving or any dinner party you attend. Tastes just like pumpkin pie in a glass! This not only makes for a great dessert – but I even love to enjoy a smaller version of this for a quick indulgent snack! Where can I buy pumpkin yogurt? I buy pumpkin yogurt at my local grocery store. You can especially find it in the yogurt isle during the holidays. My favorite is the Siggi’s Pumpkin Skyr yogurt! What can I use instead of Cool Whip? A great substitute for cool whip is coconut cream. If you buy full-fat coconut milk and let is sit in the fridge upside down overnight you can whip it in your stand mixer and use it to replace the cool whip! What can I replace the ginger snap cookies with? You can use graham crackers or granola! Let’s get to layering these pumpkin pie parfaits! This dessert is creamy, velvety and the easiest dessert you'll make this holiday season! Only 5 ingredients and tastes like a pumpkin pie with each bite. In a small bowl, whisk together the pumpkin, yogurt and honey. In a food processor, pulse the cookies until well blended and turn into a crumb. In a glass of choice for the parfaits, layer the pumpkin mixture first followed by the ginger snap crumbs and then cool whip. Layer until glass is full or desired amount is added. You can serve with a sprinkle of cinnamon on top, shaved white chocolate (I like to use vanilla candy coating for topping). Enjoy immediately - if you try to make too far in advance, the crumb layer may get soggy! 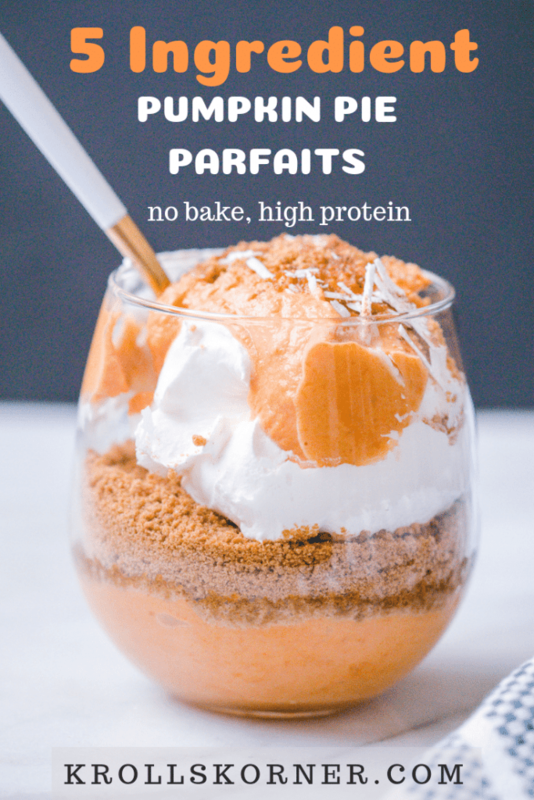 PIN THESE PUMPKIN PIE PARFAITS FOR LATER! I love that this only takes 5 ingredients to make–it looks amazing! <3! I am all about easy and tasty! 🙂 Thank you Farrah! This pumpkin parfait is WAY more my “baking” speed. Great recipe! Pumpkin Pie for breakfast is right up my alley! I am all about the easy desserts- five ingredients? Sign me up. These look so creamy and GOOD! This was such a delicious and easy way to get those pumpkin pie flavors I was craving! Aw, good!! I’m glad it hit the spot! Thank you! This is the perfect snack for a pumpkin lover like myself! All the ingredients pair so well together! Thank you so much Meme! The textures in this look INCREDIBLE. What a clever recipe! Ginger snaps for the win! What a great idea to use them! I made this with my leftover Thanksgiving pumpkin – SO GOOD! So glad you found a way to use it up! Thank you!